What If We Made Space Travel Practical? looks critically at the Cold War era decisions that shaped the U.S. space industry. It examines why these political decisions continue to negatively affect our progress. Space technology has not kept pace with advances in other technologies. The book suggests ways to move beyond our incredibly expensive space program. What If We Made Space Travel Practical? proposes methodologies to reduce the cost of space travel by 95 percent. It asks questions and proposes solutions regarding more efficient techniques for its continued development. The book suggests that space travel can become practical and economical if we choose a different path using other technologies that are available and eminently utilizable. Superior solutions have been ignored or put aside because they did not serve the Cold War political purposes. Visionary leaders would have embraced more efficient technologies. No longer is the sky the limit … Curtis Hill has woven old and new ideas into an exciting and challenging plan for the development of a unique launch system. He proposes a truly economically and feasible level that will benefit the United States as an industrial nation, one that is in need of a boost. to finally get to space. Is the space program lagging behind? Did NASA fail to move it forward fast enough? Are there more efficient and cost effective techniques to carry man into space? Can space travel become practical and economical? Are there viable options for commercial success in space? Can today’s technologies fast-forward the years of lack-luster advances? Is there a viable alternative to the current methods of space flight? The answers? One word: yes. Using Rockets to Travel into Space is Ridiculous. Rockets are expensive, high tech, high speed systems best used in the vacuum of space. They are an overkill in the lower atmosphere. For this high atmospheric drag portion of the flight, we already have an efficient solution … it’s called a jet airplane. Rockets are also an imperfect solution for the upper atmosphere. Eighty percent of a rocket’s weight is the oxidizing agent it carries. That is wasteful since the rocket is traveling through the atmosphere surrounded by oxygen. An air-breathing propulsion system using atmospheric oxygen is dramatically more efficient. Rockets are only practical during the last portion of the flight, beyond our atmosphere, in the vacuum of space. What if we only use rocket when they are practical instead of during the entire flight? What If We Made Space Travel Practical? 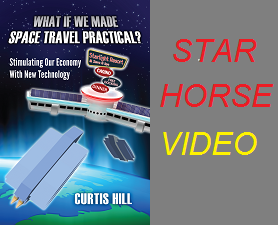 will intrigue and inspire you as you learn about the Star Horse Project, a concept that could propel the U.S. economy into the stratosphere. 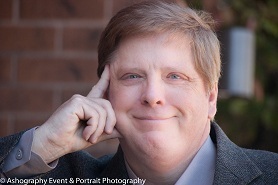 In his youth, Curtis Hill imagined that space travel in the 21st century would be commonly available and affordable. He dedicated his studies to space, obtaining 3 engineering degrees, and becoming an engineer at NASA. Deep disappointment with NASA’s lack of focus on efficiency in 1975, quickly lead Hill into a different career. Now in the 2nd decade of the new century, he realized he had gotten bamboozled, and that his youthful dreams regarding space travel were not coming true. When the termination of the Shuttle program and NASA’s emphasis on commercial space launch became a reality, a new opportunity has presented itself. Now with private commercial space entrepreneurs in the driver’s seat instead of NASA, his dreams and concepts of low cost space travel can become a reality. 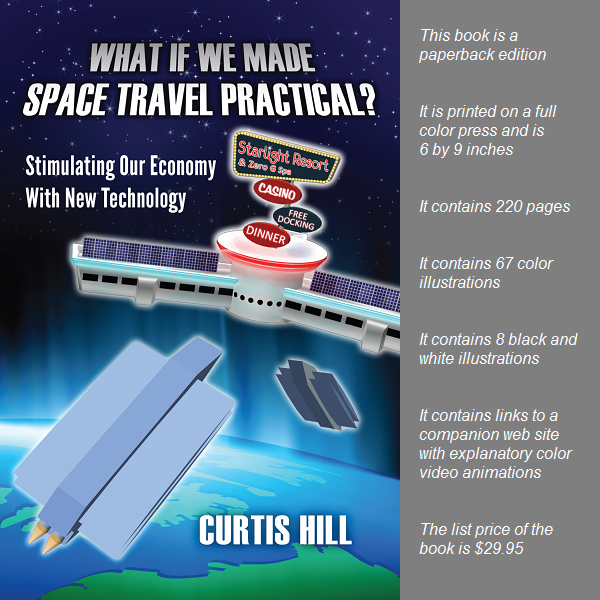 This book is Hill’s contribution to implementing the goal of low cost space travel. What If We Made Space Travel Practical? is his second book.